Tonight we welcomed back UFOlogist Thomas Wertman of MUFON. Henry pointed out that Next Week "we'd" be at Mid-South Kentucky. Ceiling Cat Barbara Duncan started off with the possible discovery of a tenth planet, beyond Pluto's orbit. Thomas indicated his being a member of the Cleveland Ufology Project, and they'd be meeting	this very night. Thomas uses an app called Stellarium which creates star maps and current satellite locaions. We discussed the slightly contraversial Robert Bigalow of Bigelow Aerospace, with a high interest in UFOs. CC reported our having listeners tonight in Canada, Ireland, Australia, Singapore, the US, the UK, and Unknown. Answering a question from the chat room, Thomas spoke of recent Ohio sightings. Henry asked, and Thomas discussed Kevin Randle, who has his own podcast of sorts, and Clifford Stone who discusses various alien species. CC has Thomas speak about Tabby Star in the constellation Cygnus, which changed brightness over the years, causing many to suspect a Dyson sphere being constructed around the star. Regular Aussie listener Jeff Dean contacted us by email regarding how cars have upgraded since Model T's, enhancing my earlier point about UFOs possibly upgrading from discs to triangle ships. CC almost flummuxed Thomas asking him what would he First Ask an alien if he was to meet one face-to-face. 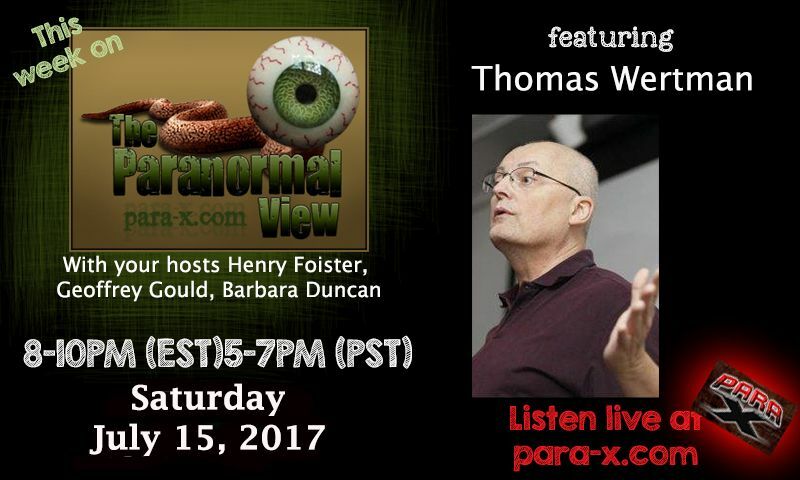 I should point out, in his previous appearances on the show, Thomas described the process of reporting a UFO sighting to MUFON. Thomas pointed out one can easily submit a sighting report via the MUFON website. Once any obvious hoaxes are eliminated, as MUFON has various branch locations state to state, the sighting is directed to the local investigation region. Henry reminded everyone that next week our guest would be actor Michael Rivers, author of Appalachia Mountain Folklore and Ghosts of the North Carolina Shores. 15 July 2017 The Paranormal View.